What energy-saving options are most suitable to be applied at a the cultivation of chrysanthemum? Together with DLV Plant, Wageningen UR greenhouse horticulture has carried out two surveys commissioned by the program 'Kas als Energiebron': one inventory for saving on electricity and one inventory for saving on heat. Many measures can reduce the electricity needs for lighting. The greatest effect is obtained by diffuse glass with anti-reflection coatings. This causes a better use of the sunlight. According to calculations, then almost 15% less lamp light is needed for the same winter production, while this glass type gives also in the summer period a few percentages more stem weight. The latest LED lamps can give 50% more PAR light per kWh electricity than HPS lamps. If, for example, half of the HPS lamps will be replaced, the electricity bill will sharply be reduced. With a total of 22 measures the heat demand can be reduced with even more than 50%. Some of these measures are at the expense of the winter production or require such a high investment that their cost effectiveness is questionable. Also in the area of heat savings, many steps forward can still be made. The company Arcadia has already shown that dosing outside air in combination with an extra energy screen can save over 8 m3/m2.year of natural gas equivalents. For this, the humidity and heat pipe settings should also be adjusted. We can also think of other measures, such as the use of drip irrigation instead of sprinkling, which causes that the crop does not have to be dried with extra heat. Cooling and dehumidication with air handling units is also an interesting measure. It assures a better summer quality and in addition, the harvested heat can be used to heat the greenhouse with aquifers and a heat pump in winter. 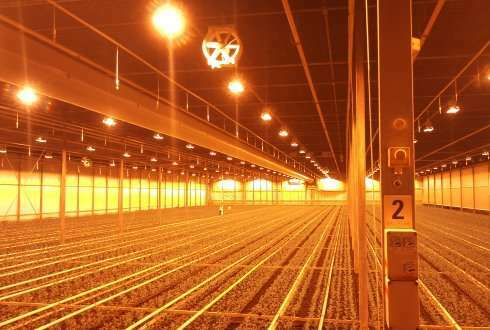 At a high gas price and a low electricity price this is a cost effective option, so that the 'chrysanthemum greenhouse without gas' comes within range. We only have to find an alternative for steam to disinfect the soil. Have you attempted microwaving the soil in batches or using a solar kiln type setup to heat the soil above a set threshold for the same purpose?